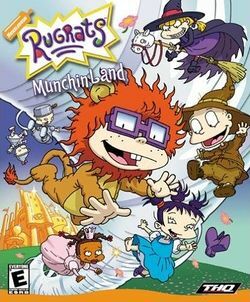 Rugrats: Munchin Land is an action game which was released by THQ upon the Microsoft Windows operating system on December 31, 2002; as the name suggests, it is the fifteenth title for the Rugrats series. It is also a parody of The Wizard of Oz, featuring Kimi as Dorothy, Susie as the Good Witch of the North, Tommy as the Scarecrow, Chuckie as the Cowardly Lion, Phil and Lil as the Tin Men given that there is two of them (not just one), and Angelica as the Wicked Witch of the West (Klasky-Csupo Inc's second Nickelodeon cartoon, Aaahh!!! Real Monsters, also spoofed the film once through a tale that Oblina read to Dr. Gromble's nephew when she, Ickis & Krumm were forced to monster-sit him). This page was last edited on 22 November 2016, at 09:30.